Inequality: A New Zealand Crisis. Mary Richardson’s comments applied to the Christchurch rebuild but these comments could equally apply to the rest of the country. This thing called Inequality is provoking much discussion across parties, researchers, economists, social justice advocates and more importantly the general public. And all of this is happening in the context of the 2014 election battle for the hearts and minds of New Zealanders. We’ve moved on from whether or not it exists, to the extent of inequality in this country, whether there’s more of it, less of it or just the same amount of it, to what type of inequality matters, and what’s the underlying cause. Here’s some links to recent discussions that capture these key themes from all perspectives. Penny McKay investigates “Does Rich-Poor Divide Matter?” and considers arguments from all sides on why inequality matters. Spot our own Paul Barber’s contribution to the debate, and listen out for Max Rashbrooke’s thinking about “the Common Store”. Brent Edwards captures a further range of arguments on the extent of inequality, the minimum and living wages as a solution for poverty, debates about increasing taxation, and much more in his 10 February 2014 column. Still more…. 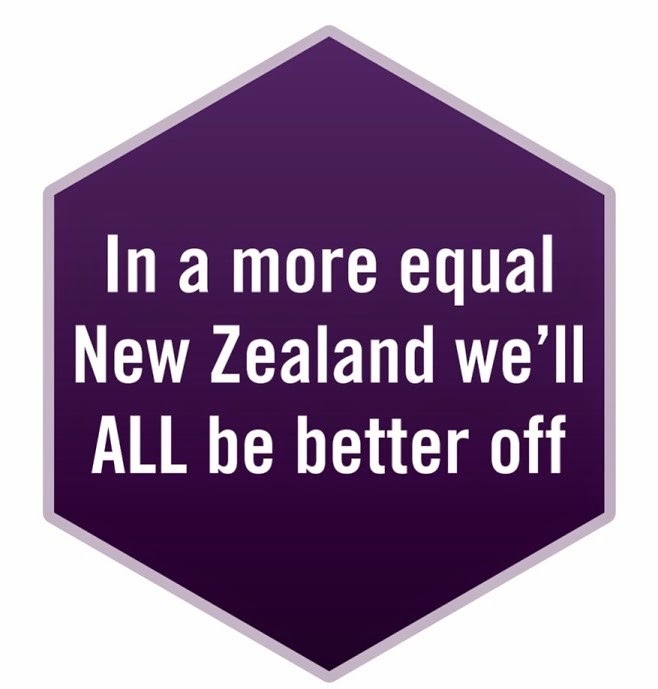 Kathryn Ryan talks with Brian Easton on his new publication Economic Inequality in New Zealand: A User’s Guide: Key Points. The interview gently guides us through some of the complexities around how inequality is measured, and Brian Easton’s thinking on solutions. Well worth a listen. With all this discussion on equality sloshing about how can we mere mortals possibly make sense of it all, let alone think about effective solutions. Well, help is at hand. Cue Jonathan Boston’s chapter What Kind of Inequality Matters? Chapter. 5, Inequality: A New Zealand Crisis, which explore questions around different kinds of inequality, what are the trade-offs, acceptable thresholds or not, and much more. The chapter is very readable, but you’ll need to get your hands on the book. The chapter suggests pure equality may not be possible due to the complexity of trade-offs and other factors, but equality in specific areas is simply a must to enable “citizens to lead worthwhile and fulfilling lives”. The article provides a nice place to keep grounded so we don’t lose sight of ….the people at the heart of this issue. a reduction in the per capita spend on gambling. If you need a reminder about what inequality looks like in New Zealand, and why we all need to care, keep this document handy! NZCCSS co-hosted a combined workshop with the Children’s Action Plan (CAP) Team in order to bring NGO and Education, Health and other social services professionals together with the team designing the roll-out of the Children’s Action Plan. A full 2 day workshop was held at Te Papa on the 28th and 29th of January 2014. 140 representatives from NGO social services (including NZCCSS member networks) and Health, Education and other service providers were present and worked hard to present to the CAP Team their advice on the best way forward for the implementation of the Children’s Action Plan. The results of their work have been published on a cloud-based website which requires a registration and login. If you would like to participate in the ongoing discussion contact the CAP Team and request access. This can be done by emailing the team at this link -my team and requesting access. This is a great opportunity to have input into the process! And Just off the Press ….. Check out the Inequality website and learn more and join the debate. Max Rashbrook is travelling around the country engaging a wide variety of people on inequality. The details will be up on the Inequality website shortly. The launch of the Vahefonua Matanikolo has been a vision in the making for many years. As Rev Goll Manuki puts it “for 8 years the Tongan Methodist Church of Mangere has looked after their land and dreamed of it providing a vibrant community where parents are supported to raise families that will contribute positively to society and where children can raise their heads and be proud to call it home. Now we have that opportunity.” This project began with planting the land to provide food for families and this was followed by the vision of a housing development. But the vision doesn’t end here. There’re plans for a hall for community activities, rental apartments and twelve units for the elderly. This vision in the making also represents a whole lot of collaboration between the Auckland Manukau Tongan Methodist Parish, the Methodist Church of New Zealand – Te Haahi Weteriana O Aotearoa, Airedale Property Trust, Lifewise and funding from the Social Housing Unit. Also there is an interesting report from Public Questions - Methodist Church that is well worth a read. What’s the point of diligently carrying out research for the common good if those further up the food chain come along and ‘suppress’ and ‘tinker’ with the results! That’s certainly the conclusion reached in a recent Guardian article on research undertaken by food policy experts in the UK in their report “Families turn to food banks as last resort not because they are free”. In a nutshell “The researchers found that a combination of rising food prices, shrinking incomes low pay and increasing personal debt meant an increasing number of families could not afford to buy sufficient food”. This evidence-based statement contrasts starkly with off the cuff claims by Minister Lord Freud (and yes a descendant of Sigmund!) and others who say “the rise in food bank use was because there were more food banks and because the food was free”. Robust, evidence-based research isn’t about hearing only what you want to hear; that’s called fiction. Read the article and report and make your own mind up. And One More …in another Guardian article, “Food banks or dignity: Is that the choice we offer the hungry?” it seems ordinary Brits are actually shocked by the rise of food banks around their country and are struggling to understand what’s happening. Sound a bit familiar. The New Zealand Carers’ Strategy Action Plan for 2014 to 2018 has been launched. “The Action Plan was developed in consultation with whānau, aiga and carers. It builds on the results and lessons of the previous Carers’ Strategy Action Plan from 2008 to 2013 and reaffirms the Government’s commitment to the Carers’ Strategy”. Click here to check out the document. "all around the nation today, people will pause in solidarity with us to remember and grieve". "We carry the prayers and the thoughts and the hopes of the nation," she said. "We also carry the burden of grief for those many families from all across the world who found they had lost loved ones in a foreign city so very far away." March / April 2014 - Palmerston North, Lower Hutt, Hamilton, Tauranga, Auckland, Dunedin, Invercargill, Nelson, Christchurch, Napier. Click here for more information on when and where the seminars will be happening near you. The Baptist Union of Great Britain, Methodist, Church of Scotland, and United Reformed Church produced this report, which explores 6 myths about poverty in the UK, and how statistics can be manipulated to support these myths. Well worth a read. UNICEF New Zealand has produced this information sheet in partnership with Beth Wood, a well-respected and long-time child advocate, regarding Section 59 in response to Colin Craig’s recent comments regarding the re-introduction of legalised hitting of children.